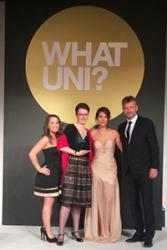 Bangor University's Pro Vice-Chancellor Carol Tully (2nd from left) receives the Whatuni Student Choice Award, with Whatuni representatives Iga Kozakiewicz and Yanxia Han, with Hugh Dennis. 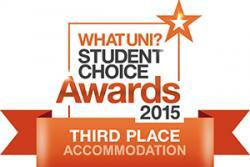 Having received six out of nine nominations for the Whatuni Student Choice Awards for 2015 including one for overall University of the Year, the University received the Award for Best University Clubs & Societies. University staff were also pleased to have been placed third in the UK for accommodation, fourth in the UK in the Student Support category, and seventh in the overall University of the Year category. The latest accolade is a further endorsement of the quality of the courses, accommodation, facilities and students support provided by the University and follows a remarkable year for Bangor which has also seen it placed top in Wales and 7th in the UK for student satisfaction, ranked in the top 100 Universities in the world for its international outlook, and rated in the top 20 in the UK for student experience. Last year, the University was shortlisted and placed among the top ten universities in the UK for the standard of Courses & Lecturers, Clubs & Societies and Accommodation. Other recent successes for Bangor University include being placed top in Wales and 7th in the UK in the UK Student Satisfaction Survey, based on student satisfaction with their university experience, being placed among the UK’s top 50 best Universities according to The Times and The Sunday Times Good University Guide 2015, a ranking in the top 100 Universities for the University’s international outlook. In other areas, the University also achieved excellent results in the independent Research Excellence Framework which recognised over three-quarters of Bangor’s research as being either world-leading or internationally excellent. The University is also among the top 10% of the world’s greenest Universities and has recently achieved the internationally recognised ISO14001 Environmental Standard.